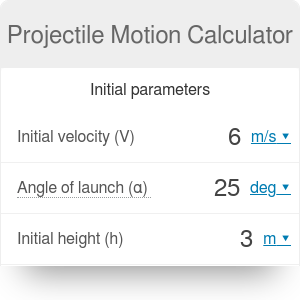 Our projectile motion calculator is a tool that helps you analyze the parabolic projectile motion. It can find the time of flight, but also the components of velocity, the range of the projectile, and the maximum height of flight. 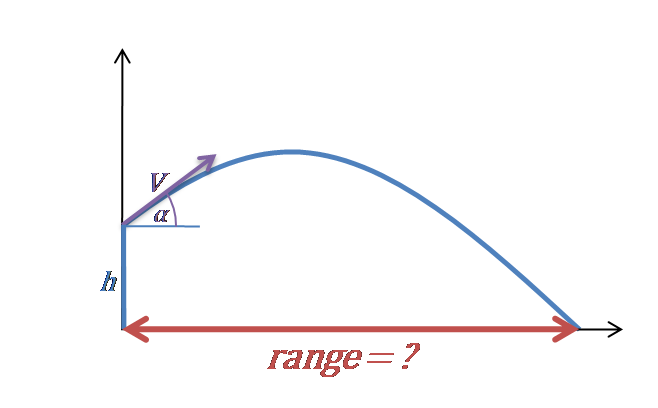 Continue reading if you want to understand what is a projectile motion, get familiar with the projectile motion definition, and determine the abovementioned values using the projectile motion equations. Imagine an archer sending an arrow in the air. It starts moving up and forward, at some inclination to the ground. The further it flies, the slower its ascend is – and finally, it starts descending, moving now downwards and forwards and finally hitting the ground again. If you could trace its path, it would be a curve called a trajectory in the shape of a parabola. Any object moving in such a way is in projectile motion. Only one force acts on a projectile – the gravity force. Air resistance is always omitted. If you drew a free body diagram of such an object, you would only have to draw one downward vector and denote it “gravity”. If there was any other force acting on the body, then – by projectile motion definition – it wouldn't be a projectile. Calculate the components of velocity. 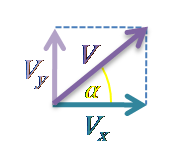 The horizontal velocity component Vx is equal to V * cos(α). The vertical velocity component Vy is equal to V * sin(α). Three vectors - V, Vx and Vy - form a right triangle. If the vertical velocity component is equal to 0, then it's the case of horizontal projectile motion. If, additionally, α = 90° then it's the case of free fall. Write down the equations of motion. Horizontal distance traveled can be expressed as x = Vx * t, where t is the time. Vertical distance from the ground is described by the formula y = h + Vy * t – g * t² / 2, where g is the gravity acceleration. 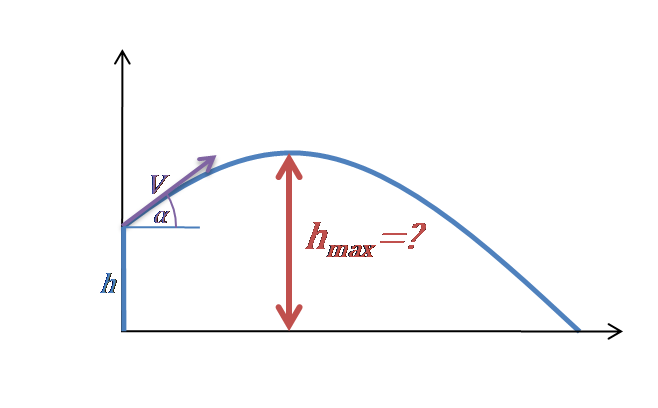 Horizontal velocity is equal to Vx. Vertical velocity can be expressed as Vy – g * t.
Horizontal acceleration is equal to 0. Vertical acceleration is equal to -g (because only gravity acts on the projectile). Calculate the time of flight. t = 2 * Vy / g =2 * V * sin(α) / g.
Calculate the range of the projectile. When the projectile reaches the maximum height, is stops moving up and starts falling. 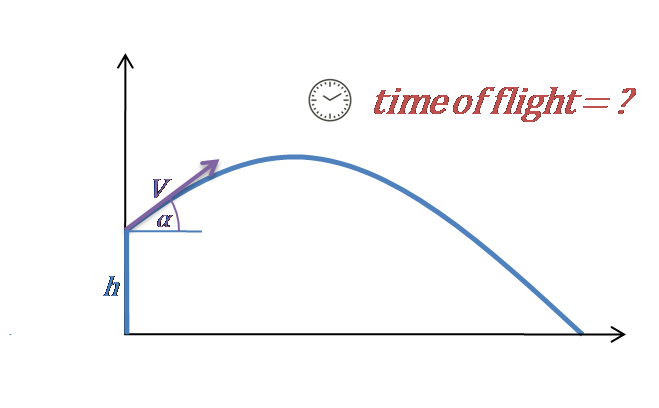 It means that its vertical velocity component changes from positive to negative – in other words, it is equal to 0 for a brief moment at time t(Vy=0). If Vy – g * t(Vy=0) = 0, then we can reformulate this equation to t(Vy=0) = Vy / g.
Using our projectile motion calculator will surely save you a lot of time. It can also work 'in reverse' – simply type in any two values (for example, the time of flight and maximum height) and watch it do all calculations for you! Projectile Motion Calculator can be embedded on your website to enrich the content you wrote and make it easier for your visitors to understand your message.